Miss B asked me when her quilt was going to be finished. Thought I'd better pull it out and do some more quilting on it. Luckily it's been cold in the evenings, so it's quite pleasant to be snuggled under it stitching away. Another finished block for my Solstice Dream, just a little bit more stitching and applique to do on the big centre block, then they can be all stitched together. Linking up to Kokaquilts for another Sew, Stitch, Snap SHARE. Third and final attempt - not perfect, but definitely not needing unpicking. Another Bellbird top has been made, same fabric just a different colour. I love wearing it, unfortunately both versions will probably be put away till spring now, far to cold in winter in the library I work in, not to wear all the winter woollies. A surplus of limes from other peoples gardens, and empty baking tins, seemed like a great opportunity to try out a new recipe. Easy Coconut and Lime cake - I doubled it, and got a very large cake and a loaf size. Very yummy, kept well, stayed moist. More great reads. Tapestry was slightly reminiscent of the Outlander series, with time slipping back to Jacobite Scotland, still a good read though, and it introduced me to a new author, who has written quite a few historical novels. I finally got brave and tackled the spiral trellis stitch on Block 4 of my Solstice Dream hanging. I have been putting this stitch off since January!! After a few unsuccessful attempts, lots of stitches were harmed in the making of these, I have three that I am happy with. 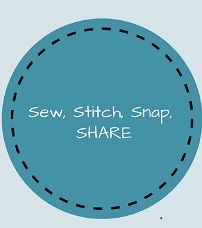 Welcome to Sew, Stitch,Snap, SHARE. Share what you're working on and be inspired by what other people are creating too. Lately it's been all about about sewing clothes here - however, I'm still working away (albeit slowly) on my WIPS. Currently I'm working on the final block for my Solstice Dream wall hanging. This is a big block, 12.5" square. I do find it a little unwieldy to sew compared with the smaller 6.5" blocks. There is lots of colour, and interesting details and challenging stitches in this block. I still need to complete the trellis circle stitches on block 4 too. Guess I can't really keep those freezer paper circles on it forever. Once all blocks are completed and sewn together, there are borders to be added and more applique work to go on those too. I am a sucker for a good wrap top, and there have been many versions in my wardrobe over the years. So when I saw the Coppelia Top by Papercut Patterns, I jumped in and bought the pattern. It comes in two styles, a cropped ballet wrap cardigan and a longer faux wrap with a waistband. I opted for the latter version, I think I'm a bit old for cropped styles now. It is a very easy and clear to follow pattern, and sews up quickly. Unfortunately, I suspect my fabric choice, which even though it's a lightweight knit - a merino/spandex blend, may not have enough stretch for the pattern to work successfully. The neck band seems quite loose, this is possibly where the extra stretch is required. I also feel that this version is a wee bit short on me in both the arms and body, so would lengthen it by a couple of inches and/or make a deeper waist band when I attempt it again. Since constructing the Coppelia top, I have spent some time online (quiet day at work) reading other blogger's thoughts on this pattern, it seems I'm not the only one to have a gaping neckband (it sounds as though I really need to stretch the neckband out a lot when sewing it on) and I don't appear to have a problem with batwing sleeves like a lot of other bloggers have. My Coppelia top is still definitely wearable, so I'll just keep it to wear as a light weight layer for my winter yoga classes, and hope that version two fits better. I don't know how I discovered this pattern, probably whilst wasting time on the Internet one weekend, but anyhow I loved the look of those loose gathered sleeves and drapey top. I thought it would be a great top for summer or for layering on those in between autumn days. Clicking on the link, I discovered that the pattern was designed by a New Zealand company called The Sewing Revival. The pattern was duly purchased, printed out and pieced together. A quick trip to The Fabric Shop in Otara, resulted in some fabrics being purchased - a beautiful printed rayon and a textured cotton/rayon/wool blend. My bust is in between sizes but going on the overall width of the completed garment I made an XS. Possibly it fits a little too snug at the hips, so maybe next time I may try the S size. Over all a quick and easy pattern to make, clear instructions, though I edged all my pieces first rather than after I had sewn seams (I don't have an overlocker) and I stay stitched the neckline before adding the facings. I'm quite pleased with how this has turned out, and foresee a few more in my wardrobe's future. Invariably when one starts to tidy up their sewing room, there is a usually a new project started or an old WIP finished. In my case it was a finish, I came across the Liberty and linen quilted pillow tops I started back in November, rather than faffing around installing zips, I used the fabric intended for the binding of Miss B's Sea Glass sampler quilt, and made two simple envelope backs. So quick to do, so simple - why did I wait so long. These are now residing on my bed, mine's the pretty Liberty one, The Scout's is more masculine, well as masculine as it can be with glittery linen. Linking up to Sew, Stitch, Snap, Share at with Linda at KokaQuilts.